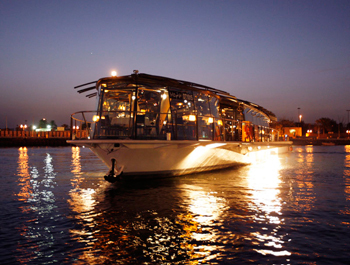 Bateaux Dubai, the glass-enclosed, air-conditioned luxury vessel that cruises along the Dubai Creek has now introduced its summer rates of just AED245 and AED345, valid till 31st August 2013. Every night, the boat commences boarding at 7.45pm and departs at 8.30pm, lasting for two and a half hours. Guests can experience 360 degree views of the Creek with a selection of beverages and live musical entertainment. With the oncoming summer, the Bateaux Dubai cruise provides for a perfect, cooled outdoor dining location.